An important mission of neuroinformatics is to promote new neuroscientific discoveries by providing an infrastructure in which brain-related data can be meaningfully shared and integrated. A major hurdle thereby is that brains differ across individuals, so that data measured at the same x,y,z-location in different brains cannot be compared. Brain atlasing is the scientific discipline that tackles this problem with two major strategies. The first is to try and attach data not to x,y,z-coordinates but to named brain regions that are defined by objective criteria, such as histochemical, electrophysiological and hodological (connectional) features. The second is to warp each brain in a dataset to a brain template that is chosen to be the standard. This warping, also called registration, can be surface- or volume based and optimizes some measure of similarity between the moving and fixed data. Warping is easiest when the two datasets have the same dimension (2d, 3d) and modality (T1, T2, Nissl, etc. ), but the registration of slices to volumes and across modalities has also been successfully applied. In this workshop, we look at progress that has been made in brain atlasing, with a particular emphasis on infrastructure and workflows that allow individual researchers to apply atlasing techniques to their own data. The workshop consists of two parts. In the morning session, atlasing experts present their work, tools and outlook. In the afternoon session, neuroscientists are invited to meet up with the atlasing experts to test and discuss whether the tools meet their requirements. Fons Verbeek (LIACS) Building a digital atlasing infrastructure and studying zebrafish. Stefan Klein (EMC) and Marius Staring (LUMC) Elastix software package for linear and nonlinear image registration. Rembrandt Bakker (Radboud Univ.) Scalable brain atlas of mouse, rat, opossum, marmoset, macaque and human, with new registration services. Andrew Reid (FZ Jülich) JuBrain Cytoarchitectonic Atlas applied to fMRI meta-analysis results. Hakim Achterberg (EMC) FASTR pipeline engine to accelerate imaging pipeline development. Boudewijn Lelieveldt Pipeline to ingest the vast data resources of the Allen Institute. Stanislaw Adaszewski Human brain project neuroinformatics platform: big data challenges in image registration. 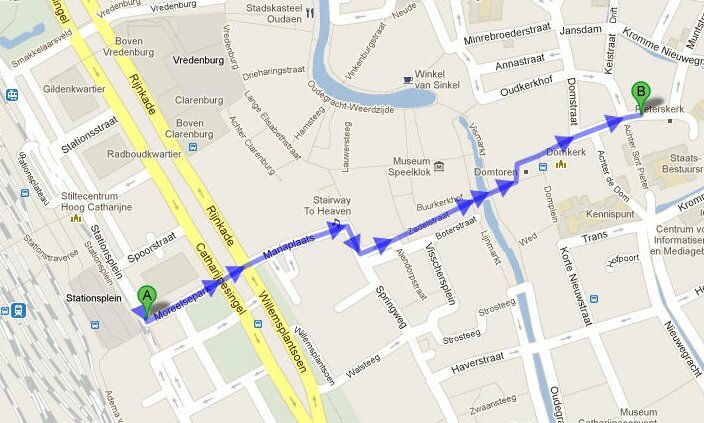 View the route from Utrecht Central Station on Google maps. The distance is 1.2 km. If you lose your sense of direction: you have to walk past the big historical tower "Domtoren".